Just a few years ago, I was like anyone else. I shampooed my hair with some sort of “herbs and botanicals” shampoo that, unbeknownst to me at the time, was actually perfumed with parabens, and washed my clothes with the scent of Summer Rain, or some other vague fresh-sounding “fragrance.” I sprayed my countertops with the strongest anti-bacterial cleaner (because that’s what any responsible person does, right?) and used all sorts of other conventional, chemical-heavy aerosols, lotions and potions. Fortunately, at some point, I got the memo on just how toxic all of these things are. The bad news is, most of us are covering our homes, clothing and bodies with a cocktail of chemicals each and every day. Did you know that using conventional house cleaning products even as little as once a week, over time, can cause damage equivalent to smoking 20 cigarettes a day? The good news is, we can change this. One of the easiest ways to get started is to use non-toxic cleaning agents for your home. You can replace a whole cupboard full of commercial products with just a few ingredients, many of which are likely already found in your kitchen. One of the ingredients we like to include in our DIY concoctions is oregano oil. It has so many powerful properties which have been proven useful by centuries of traditional use, and modern science alike. The Ancient Greeks used oregano to treat poisonings and skin irritations, and Hippocrates was known to apply it as an antiseptic. Today we know that the antibacterial and antifungal properties of oregano can be attributed to phenols in the natural oil of the plant, including thymol and carvacrol. These are concentrated 1000-fold when the plant is distilled into essential oil. Research has shown that oregano essential oil is incredibly effective against a wide range of disease-causing bugs, including E.coli, Salmonella, campylobacter and drug-resistant Candida yeast. Another study showed promise for killing parasites and destroying some types of cancer cells. Amazingly, oregano oil is even effective when pharmaceutical antibiotics have failed, such as in the case of the deadly superbug MRSA. 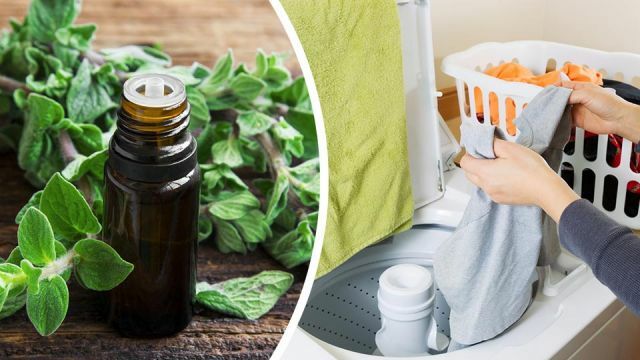 Surely you’re impressed by the protective power of oregano oil, but you might be wondering whether it might be a bit strong to use around the home and on your body. Certainly caution should be employed — you should always dilute essential oils to a safe level, especially “hot oils” that cause a sensation on the skin, like oregano oil. Be sure to follow a recipe and remember that less is more. However, you can be reassured by the fact that researchers have found oregano oil is strongly active against pathogens, while leaving beneficial bacteria (such as the probiotics in your gut) mostly undisturbed. And using oregano oil around the house will not only leave you with less bacteria and mold, but you’ll also enjoy reduced inflammation and fewer allergies and respiratory problems. Without further ado, here are some ideas for cleaning your home with oregano essential oil. Let’s start with a multi-use cleaning recipe that you can use for almost anything. Simply mix two cups of water with two teaspoons of pure castile soap and 20-40 drops of essential oil. We recommend a mix of oregano and lemon essential oil for antibacterial and degreasing action. You can also add a few drops of peppermint or grapefruit for a fresh scent. Here’s an extra tip: Instead of using a regular plastic spray bottle, make your own glass spray bottle which prevents any chemicals from leaching into your non-toxic cleaner. Take the nozzle top from a plastic spray bottle, and experiment with different glass bottles, such as those used for vinegar or wine, to see which one fits. Store the mixture in a cool, dark place, since the essential oils oxidize when exposed to heat or sunlight. Note that non-toxic cleaners such as this one should still be stored out of reach of babies and children. They are much safer than chemicals, but still should not be directly consumed, applied or inhaled, especially by sensitive little ones. There are many ways you can deodorize and disinfect your home with oregano essential oil. Here are some ideas to get started. Spray grimy or greasy surfaces with the multi-purpose cleaner described above. This is especially useful when you’ve been working with raw meat or fish, or when someone in the family is sick and you want to prevent the spread of germs. De-gunkify those forgotten corners of the bathroom with your oregano oil cleaner and feel confident that your whole home is fresh and clean. If you find yourself holding your breath when you take out the trash, perhaps it’s time to take your all-purpose oregano oil cleaner to the trash can. A few quick sprays will reduce odor and bacteria. Borax is another great option for deodorizing around the home. If you have a stinky, grimy drain, spray a generous amount of the oregano oil all-purpose cleaner and let it sit for several minutes. Repeat regularly to keep damp areas mold- and bacteria-free. Try blending one part essential oil with ten parts coconut oil and rub it on your hands. This is a more nourishing and body-friendly hand sanitizer, without any of the alcohol that conventional products contain. If you have a particularly filthy load of laundry (sports gear anyone?) or perhaps some towels that sat damp too long, add a drop or two of oregano oil to the load and you’ll find they come out smelling surprisingly fresh. If you’re concerned about mold, or if it’s cold and flu season, try diffusing some oregano essential oil. A little goes a long way, so try putting just a single drop in your essential oil diffuser. You can also add other antibacterial and antiviral oils such as clove or rosemary. With all the natural options out there, there’s really no excuse to be subjecting yourself and your family to the dangers of conventional cleaners. Learn about more non-toxic cleaning ideas. Hey Buddy!, I found this information for you: "8 Ways To Clean With Oregano Oil". Here is the website link: https://www.thealternativedaily.com/8-ways-to-clean-with-oregano-oil/. Thank you.